This video states that the official story of 911 is filled with contradictions and inconsistencys. Its based on a book by david ray griffin, which defines 25 inconsistencys with the 911 commission report. I actually own a copy of this book, and am willing to answer questions on his thesis. 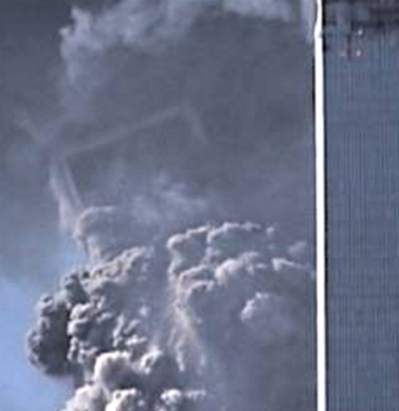 The undamaged top of the South Tower can be seen tilting over at a 22°angle. Last edited by been-there on Wed Sep 12, 2018 12:22 pm, edited 3 times in total. I don't think that NIST or any other government agency has ever given an adequate explanation for that. 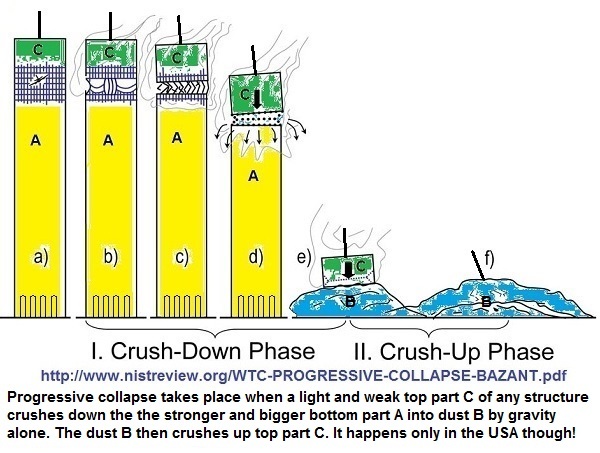 NIST rejected the theory that the WTCs could have been demolished, because they would have heard the explosions. Yeah, that was their actual justification. 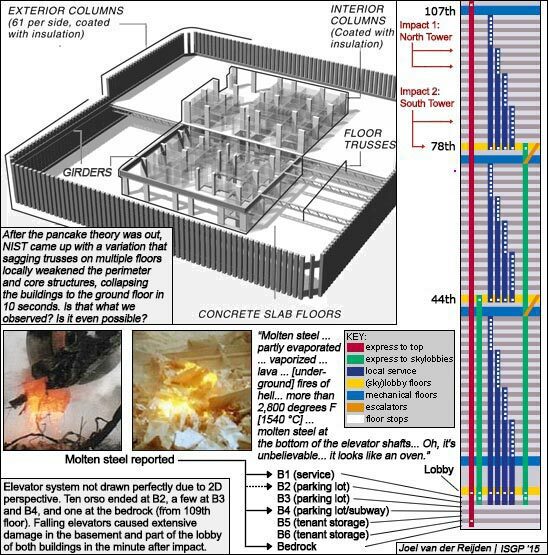 They completely ignored the possibility of something like thermite being used to cut the core columns. 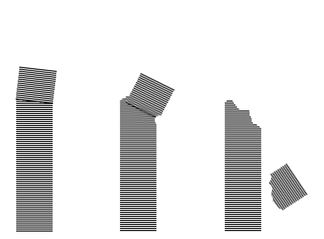 I think it has something to do with the center of mass, and how a building can only tip over a certain amount. This is mainly determined by their metacentric height, IIRC. But you are right in that the collapse mechanism is inconsistent with something purely driven by gravity. Theres no way that the columns could have been heated to the degree needed for them to sag like that and set the collapse into motion. This image goes into a bit of detail about the center of mass issue. 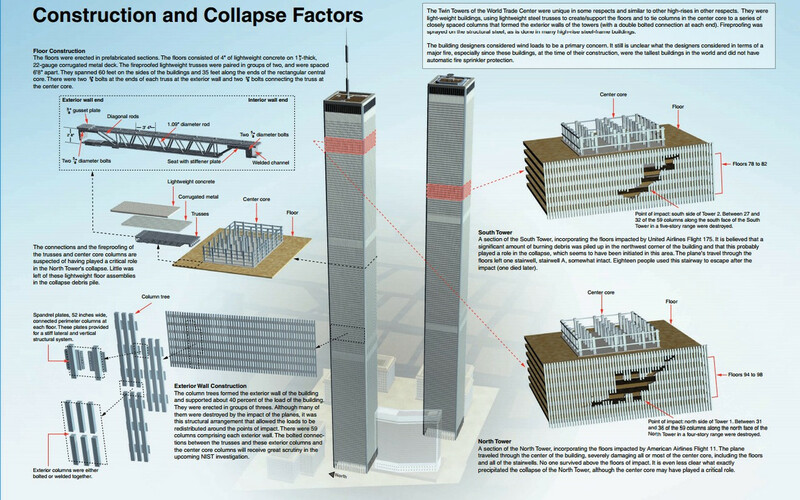 The "undamaged" top portion of the second WTC weighed approximately 180,000 TONS! The only force acting on the tower is gravity and the force vector is straight down. The fact that initially the top portion tilted 22 degrees tells us there was a torque applied for a brief period of time and that came from the undamaged exterior structure opposite the entry side holding on until it snapped. Other than that, please tell us where the lateral force to move 180,000 tons (give or take) sideways for hundreds of feet as shown in your diagram comes from? The second plane was estimated to be going about 586 mph with a weight of approximately 140 tons. That's an approximate momentum (mass times velocity) of 82K tons-miles/hour striking the side of the building laterally. The plane in the initial crash did considerable damage to the side of the building. The top portion in the first second of its fall would have achieved an approximate speed of 20 mph taking into account some resistance. The momentum of that portion was approximately 2,800,000 (two million eight hundred thousand) tons-miles/hour striking the top of the remaining structure straight down. It's no mystery why the towers collapsed the way they did. As the joists on one or two of the most heavily burned floors gave way and the outer box columns began to bow outward, the floors above them also fell. 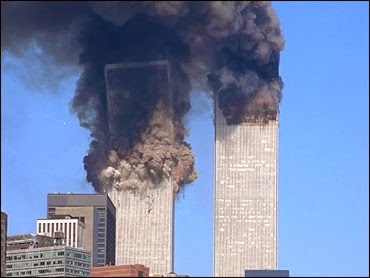 The floor below (with its 1,300 t design capacity) could not support the roughly 45,000 t of ten floors (or more) above crashing down on these angle clips. This started the domino effect that caused the buildings to collapse within ten seconds, hitting bottom with an estimated speed of 200 km per hour. 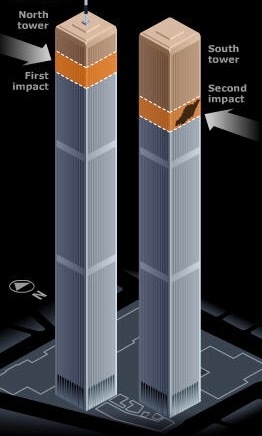 If it had been free fall, with no restraint, the collapse would have only taken eight seconds and would have impacted at 300 km/h.1 It has been suggested that it was fortunate that the WTC did not tip over onto other buildings surrounding the area. There are several points that should be made. 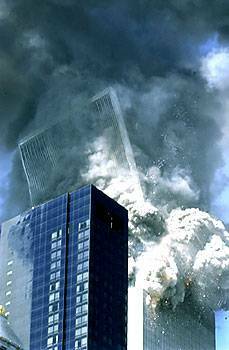 First, the building is not solid; it is 95 percent air and, hence, can implode onto itself. Second, there is no lateral load, even the impact of a speeding aircraft, which is sufficient to move the center of gravity one hundred feet to the side such that it is not within the base footprint of the structure. Third, given the near free-fall collapse, there was insufficient time for portions to attain significant lateral velocity. To summarize all of these points, a 500,000 t structure has too much inertia to fall in any direction other than nearly straight down. 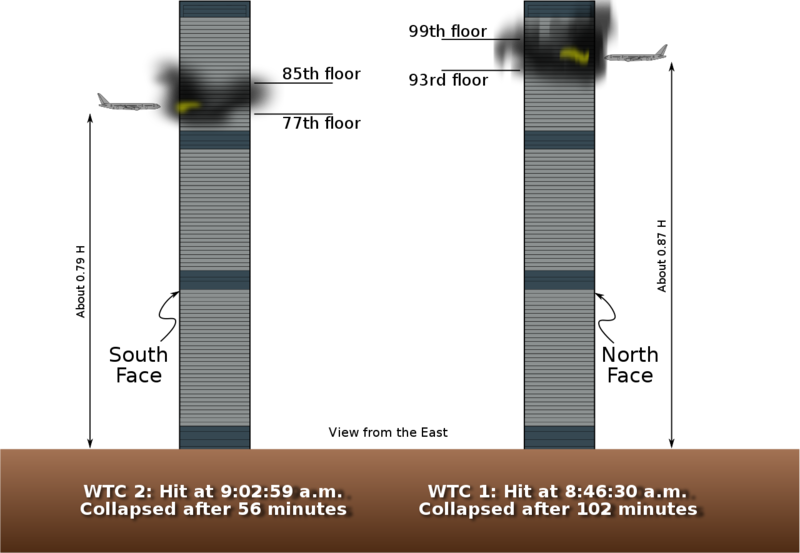 It has been suggested that it was fortunate that the WTC did not tip over onto other buildings surrounding the area. There are several points that should be made. 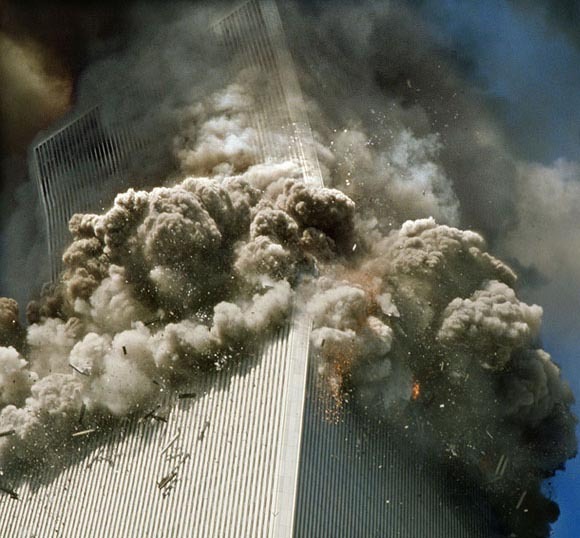 First, the building is not solid; it is 95 percent air and, hence, can implode onto itself. Second, there is no lateral load, even the impact of a speeding aircraft, which is sufficient to move the center of gravity one hundred feet to the side such that it is not within the base footprint of the structure. Third, given the near free-fall collapse, there was insufficient time for portions to attain significant lateral velocity. To summarize all of these points, a 500,000 t structure has too much inertia to fall in any direction other than nearly straight down. So... because THREE TOTALLY SYMMETRICAL collapses were just two seconds slower than total freefall, that means the collapse of THREE highrise buildings was to be expected??! Amazing that people who believe arguments like this dare go in to high rise buildings if they think the WTC collapses are explainable by that kind of argument. Even if that were correct it would NOT explain the completely symmetrical collapse of all three buildings. Nor does it explain WTC7 with all its floors collapsing simultanoeusly from the bottom up. It slightly tilted towards the north(? ), which the demolition expert Tom Sullivan describes as quite in accord with a controlled demolition. N.B. "Edited" only to fix image links. Last edited by been-there on Wed Sep 12, 2018 12:27 pm, edited 1 time in total. This is one of the most stupid statements I ever heard about skyscraper buildings. Yep, the airplanes hit mostly air (95%), not the tangible parts of the skyscraper buildings (5%). This is the kind of imbecility expected from Holocaust believers like aemathisphd. Last edited by Werd on Sat Sep 16, 2017 2:09 pm, edited 1 time in total. I have doubts about the legitimacy of the "official" 9/11 commission's investigation, but honestly this video kinda just makes skeptics look like idiots. A building like either of the WTC towers is not the same thing as a solid brick of material like the guy in this video demonstrates, and there is zero reason to expect that it would act exactly like a solid brick of material. Essentially, it's more like a bunch of toothpicks all experiencing stress and strain and otherwise hollow throughout (at least in terms of structural integrity). Specifically, the cement does not provide "extra" structural integrity, as many truthers tend to insinuate. Cement is very brittle and would actually be relatively easy to crumble with the downward force implied by the failure of the upper stories. You need to focus on the steel structure. Prove the redundancies built into the structure of the WTC would certainly have prevented global collapse in the event of a local failure, then we'll talk. I tend to think most of this Infowars-tier pseudo-physics building collapse stuff is disinformation to keep people asking the wrong questions. Follow the money if you want the truth about 9/11.